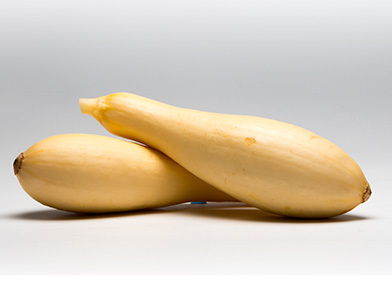 More formally known as Yellow Straightneck, these squash have a thin glossy skin that can vary from a light butter yellow to a bright lemon yellow, pebbled with bumps or smooth, encasing a paler yellow or white flesh. For best flavor and texture, the squash are harvested when they are five to six inches in length or less. It offers a classic summer squash flavor: mild with nuances of black pepper and nuts and a slightly buttery flavor when cooked.